Measuring the Universe in 'Miss Leavitt's Stars' George Johnson talks about his new book, Miss Leavitt's Stars: The Untold Story of the Woman Who Discovered How to Measure the Universe. Henrietta Leavitt, while working at Harvard College's observatory in the early 20th century, discovered a way to measure distances between stars, which led astronomers to calculate the size of the universe. George Johnson talks about his new book, Miss Leavitt's Stars: The Untold Story of the Woman Who Discovered How to Measure the Universe. Henrietta Leavitt, while working at Harvard College's observatory in the early 20th century, discovered a way to measure distances between stars, which led astronomers to calculate the size of the universe. If you Google famous astronomers, the list is nearly all men, from Copernicus to Galileo through time to Sir Isaac Newton and Stephen Hawking. There are a few women's names, but you've probably never heard of them. Take one of the first mentioned, Henrietta Leavitt. In the early part of the last century, it was her discovery that made it possible to measure the universe, one of the greatest breakthroughs in astronomy. George Johnson is the author of a new biography called "Miss Leavitt's Stars." He joins me from member station KANW in Albuquerque. Mr. GEORGE JOHNSON (Author, "Miss Leavitt's Stars"): Hi. It's good to be here. LUDDEN: First, a century ago--nearly a century ago, women didn't have a leading role in astronomy. 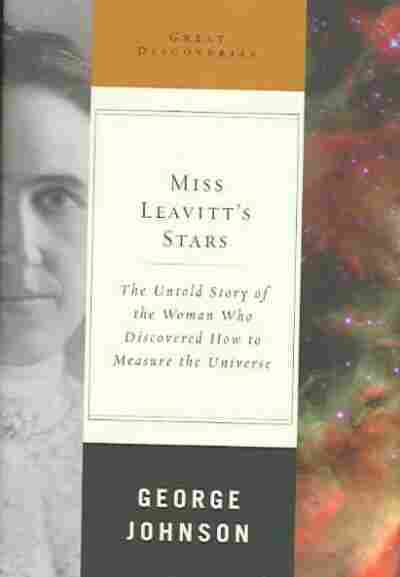 Henrietta Leavitt and a number of other women were working at Harvard College Observatory. Tell me what they were doing there. Mr. JOHNSON: Well, they were actually hired as computers. They really called them that. You know, they didn't have anything like electronic computers there; they just had these clunky, old, mechanical calculating machines. And the best way to do fairly complex calculations was to hire people to do it. So they would pay women like Henrietta Leavitt minimum wage essentially, 25 cents an hour at the time, to add up long columns of numbers and do other kinds of menial mathematical tasks. LUDDEN: And to what end? What was--all these numbers, what were they supposed to lead to? Mr. JOHNSON: They were trying to map the sky, really to put together a chart of all the stars that were visible from the Earth, either with the naked eye or with telescopes and time exposures. And they had a telescope high in the mountains in Peru, and then at night they would expose these glass photographical plates. And then they would ship them around the horn to Boston Harbor, unload them, bring them in, and they would pay people like Henrietta Leavitt to measure the brightnesses of these stars and then do calculations on their magnitudes. It was very, very tedious but very important work. LUDDEN: Well--and one of the problems they had was they didn't quite know how to measure all these distances. Right? I mean, they didn't know how bright stars were in every case. Tell me what their problem was. Mr. JOHNSON: No. I mean, you know, if you look out your back porch at night--say, you're looking out across a dark field, and you see two lights and one of them is brighter than the other, you have no way of knowing that it's actually brighter than the other or if it's just closer. When you look up at the nighttime sky and you see a bright star, is it, you know, inherently bright, or is it just a lot closer than the one that appears dim? It was--you know, it seemed like an almost impenetrable mystery. LUDDEN: So what did Henrietta Leavitt discover that helped them figure this out? Mr. JOHNSON: Well, imagine this room full of these women, you know, most of them with their hair up in buns and their dresses buttoned up to the collars, a very Victorian scene. And they're all sitting in this room, and each one is staring at a glass photographic plate. And they're scrutinizing it, trying to measure the brightness of these stars, writing down the numbers in fountain pen in a ledger, doing these calculations. And in the midst of all this, suddenly Henrietta Leavitt notices this pattern; that some of these stars vary in brightness. They pulse like beacons, so every 30 days they go from dim to bright to dim again. And she was studying these variable stars when she suddenly noticed that the brighter the star, the slower it blinked. She figured out that how fast the star was blinking told her how bright it really was. And if you know how bright it really is, you can see how dim it appears to you from the distance of space, and then you can calculate how far away it is. LUDDEN: Hmm. Did she ever have a sense of the importance of her discovery? Mr. JOHNSON: She certainly knew that it was being put to good use, but I think she would have been astounded if she could have lived longer and found out the implications of what she started; that we live in a universe that's supposed to be 13 billion light years in radius in every direction that we look out. And we know that, really, because of this yardstick, the first rung of which is Henrietta Leavitt's measuring stick. LUDDEN: So we know that the universe is so much larger than they ever fathomed at that time. Mr. JOHNSON: Well, what really astounded me when I started looking into this was as recently as 75 years ago, it was a matter of scholarly debate whether the Milky Way constituted the entire universe. And it was believed that maybe there weren't any other galaxies; it was just the Milky Way. And when you saw things like the Magellanic clouds or Andromeda, these little fuzzy hazes off in the sky, you had no way of knowing whether these were galaxies as large as the Milky Way but very, very far away or if they were just little kind of smudges in the sky, you know, little gas clouds that were much nearer in. So this was really up in the air until Henrietta Leavitt came up with her means of measuring great distances using these variable stars. And it was because of that that later astronomers--the most important was Edwin Hubble--figured out that Andromeda really was another galaxy on the order of size of the Milky Way. And then, of course, today, you know, we believe that there are billions and billions of galaxies out there, and none of this would have happened without Henrietta Leavitt coming up with some kind of measuring stick. LUDDEN: George Johnson is the author of a new biography called "Miss Leavitt's Stars: The Untold Story of the Woman Who Discovered How to Measure the Universe."